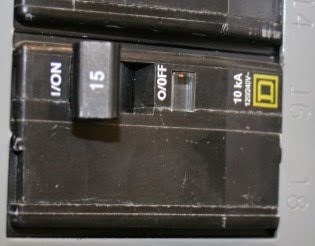 DIY Knifemaker's Info Center: VFDs: Part 2 - Can You Feed a VFD? Can You Feed a VFD? VFDs for small motors, typically up to 1 horsepower can be run from a regular 120 V circuit. These include the KBAC-24 and KBAC-27 models. However to get the most out of your grinder you probably want to run between 1.5 and 3 horsepower. It is highly recommended that you have 240 V in your shop. 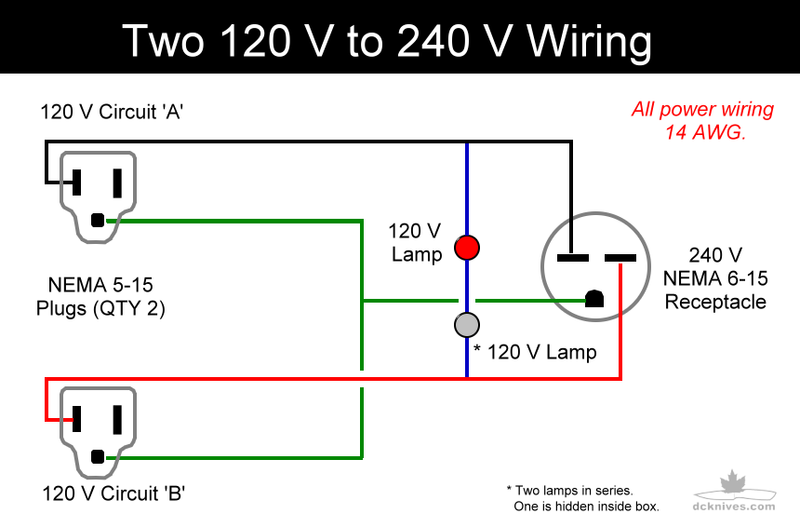 For a 240 Volt circuit we will need a 2 pole (double) circuit breaker so one red and one black can be sent to the load. The circuit breaker is critical safety device and is designed to prevent a fire in the event of a wiring fault or appliance failure. You will need 240 Volts and a 2 pole breaker similar to that one shown, in either 15 to 20 A. You'll want the breaker to feed a receptacle so you can plug in and unplug your grinder in. In North America these receptacles look like one of the NEMA 6 receptacles pictured below. Yup, these don't appear the same as your basic household receptacles for good reason. They are for 240 V only and for safety are incompatible with your other appliance cords. 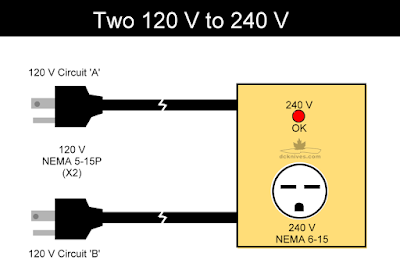 NEMA 6 receptacles come in a few different sizes, but the one's we are most interested are 15 A and 20 A versions as shown. There is one alternative which is a NEMA L6 (L6-20 shown). The L is for locking. These are great as they reduce the risk of accidentally unplugging the machine. The cable to power your VFD needs to be suitably rated to handle the required current and not over heat. Most VFD manufacturers will supply this cable size information in a the installation guide. As a rule of thumb we can use the electrical code (NEC/CSA) to get an idea of what size of cable we're going to need. 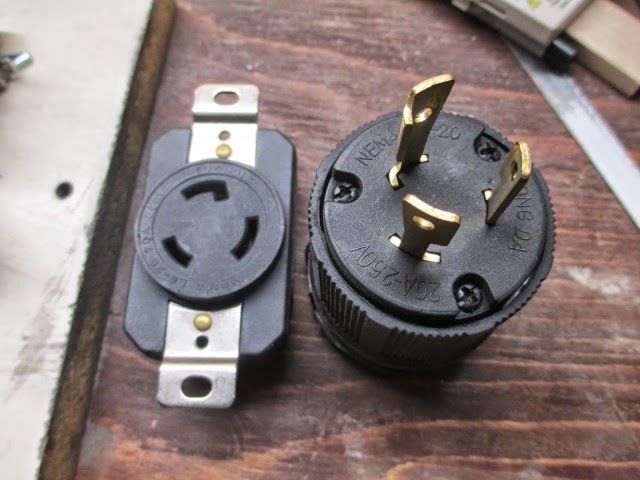 From the breaker to the receptacle will need some NMD (that familiar ole house wiring with the white or cream color jacket) you'll need some 14 AWG or 12 AWG depending on the breaker and receptacle that needs to be wired. Check with your electrician friend. 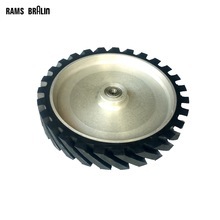 You want to situate the receptacle close to where your grinder will be setup. From the plug to the VFD, you'll want something more supple such as SJOOW or SOOW cable which has a black neoprene jacket and has a good temperature rating. SJOOW (the J stands for Junior) is rated for 300 Volts, which is good. If you happen to find some SOOW it is rated for 600 V, which is more than you need, but works just the same. The last piece of the power up puzzle is the plug. You will need a NEMA 6 (or NEMA L6) plug to match your receptacle. A lot of folks have 240 Volts in their shop or garage, but don't have a suitable receptacle. You will want to get an electrician to install a receptacle and/or circuit breaker for you. Please consult with one. Maybe you can swap a knife for some electrician's time. On a side note, these types of joiner boxes are sold. They remove the need to install a permanent 240 V receptacle. The basic wiring in this box can be seen here. Note, this information is for educational purposes only and is not intended to replace the advice of a qualified electrician. Next we'll take a look at what we need for a motor. Silly, stupid question here... I've had an electrician wire a 240v, 50 amp line for my welder. Is there a concern if I use this for my VFD? Thanks! You can use the 50 A circuit as long as the wiring you use to power the VFD input is suitable for 50 A and the VFD can accept that size of conductor at its line terminals, then yes it's fine. This is going to be around AWG #6 or #8 (depending on your locale). As copper is fairly expensive, it may be more economical to install a double 20 A breaker and wire with AWG #12. This would entirely depend on the capacity of the VFD length of wire involved. Another consideration may be that the 50 A circuit for the welder likely doesn't have a neutral. 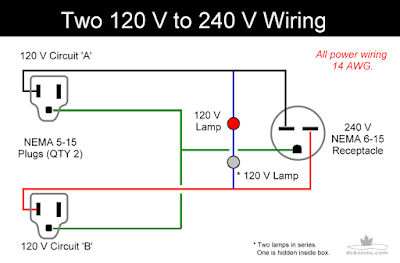 This means you can certainly supply 240 V, but there will be no 120 V available. 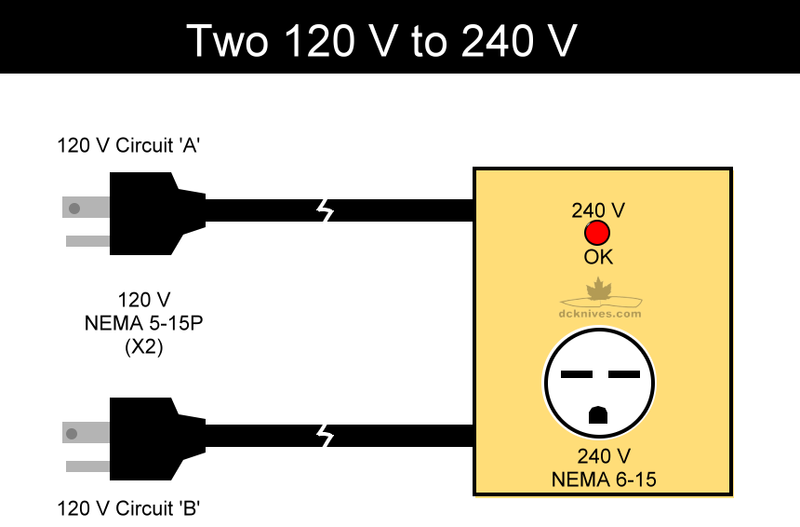 If you wanted to power a 120 V lamp or control circuits, you'd need a neutral or a transformer to get 120 V. Most smaller VFDs only need L1, L2 and ground, which is what welders commonly use. Here's a thought. What if I were to use a 50-30 Pigtail and then wire THAT into the VFD? For example: http://www.adventurerv.net/amp-male-amp-female-dogbone-pigtail-adapter-lighted-pro-grip-p-30239.html?gclid=COzOmNSUuNECFQSMaQodUJwHWg&utm_campaign=partsfeed_ppc&utm_medium=cpc&utm_source=Froogle for an example.